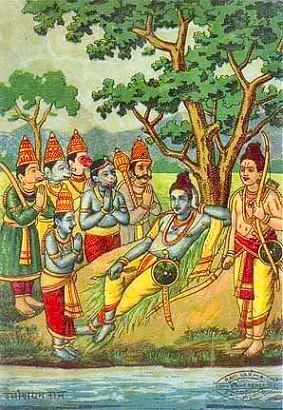 RAMA is also known as RAM and RAMACHANDRA. His father was DASARATHA, the king of Kosala, the capital of which was Ayodhya. His mother was KAUSALYA. His half-brothers were LAKSHMANA, BHARATA, and SATRUGHNA. His Master was VASHISHTHA. He married SITA (also called SHRI, LAKSHMI, VIDEHAKUMARI and JANAKI), daughter of the Perfect Master JANAK, the king of Videha, and his wife SUNAYANA. 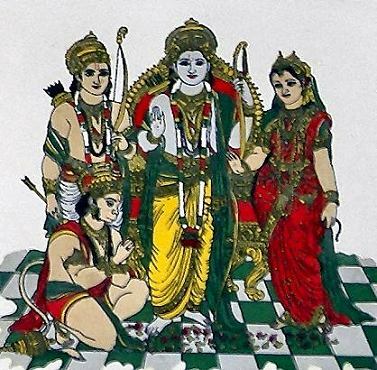 Rama and Sita had two sons, LAVA and KUSHA, who grew up in the hermitage of the Master VALMIKI. Another sage connected with Rama was VISVAMITRA. Among Rama�s disciples or devotees were HANUMAN, SUGRIVA, JAMBAVAN, JATAYU, NALA, NILA, VIBHISHAN and PINGALA (a former prostitute). Rama�s �enemy� was RAVANA, king of Lanka (Ceylon), who kidnapped Sita and died in battle with Rama. For more about Rama, see LM4 p1259, MJ 1:4 p18-19.